Studio classes teach procedural skills (the use of specific techniques, approaches, tools, and media) in relation to concepts and ideas (schools of art/design, architectural movements, dramatic styles, intellectual, social, and political trends, etc.) while setting the conditions, examples, and inspirations to spark creativity and exploration. Rosenberg, along with others, argues that “teaching people to be artists is impossible” (p.136). Nevertheless, creative imagination can be fostered when students have the opportunity to observe artists (or architects, actors, directors, etc.) working, talking, and interacting. Part of the task of the instructor, therefore, is to allow students glimpses into her own and other artists’ creative processes and the artistic community that sustains them. Students, therefore, should not just be taught technical skills — though these are important — but exposed as extensively as possible to art and the people who create it. Guest artists/lecturers, master classes, field trips, demonstrations, etc. can thus be a valuable dimension of studio courses. One of the challenges in studio courses is to balance the development of technical proficiency with conceptual understanding. As Walker writes: “Materials, techniques, subject matter and formal qualities deserve attention in planning studio instruction, not at the expense of interpretive meaning, but in relation to it” (1996, p.14). Instructors should ask questions and design exercises that require students to reflect deeply on what they and other artists are trying to express. 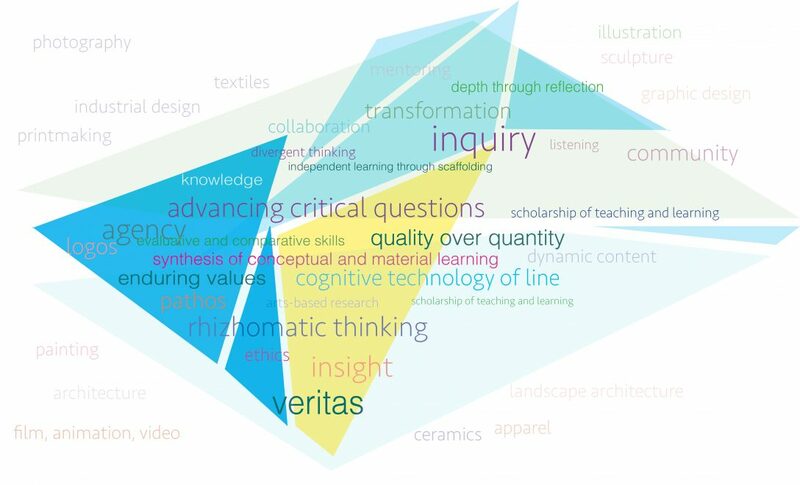 Depending on the discipline – art, architecture, design, music, drama – there are significant differences in how studio classes are conceived, making generalizations about teaching strategies difficult. The instructor situates the particular exercise or task within the context of the course and discipline, so that students can see its relationship to other core concepts, practices, etc. The student listens, thinks, answers questions. The instructor models expert practice while describing and explaining each step of the process from planning (selecting materials/tools, organizing work space, conceptualizing the task) through execution; answers student questions. The student observes, listens, asks questions. The instructor provides guidelines, steps, and parameters to structure student exploration. The student conceptualizes the task and begins planning. The instructor provides coaching and feedback while students engage in the exercise themselves. The student engages in the practice, asks questions, reflects on own practice in relation to expert practice. The instructor assists only when requested. The student practices the real thing alone or in groups. Collins, A., Brown, J.S., & Newman, S.E. (1989) “Cognitive Apprenticeship: Teaching the Crafts of Reading, Writing, and Mathematics”. In Knowing, Learning, and Instruction: Essays in Honor of Robert Glaser. Lauren B. Resnick, Ed. Hillsdale, NJ: Lawrence Erlbaum Associates. Levy, A. (1980) “Total Studio”. Journal of Architectural Education, 34 (2). Rosenberg, H. (1964-1965) “Problems in the Teaching of Artists”. Art Journal, 24 (2). Walker, S. R. (1996) “Designing Studio Instruction: Why Have Students Make Artwork?” Art Education, September.